Partners in crime. 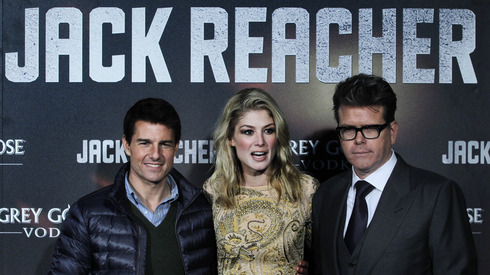 Tom Cruise, Rosamund Pike and Christopher McQuarrie at the Spanish premiere of "Jack Reacher." Associated Press. “Reacher,” co-starring Robert Duvall, Rosamund Pike and Werner Herzog, is the third Christmas release from Cruise and McQuarrie (Oscar-winning screenwriter of 1997’s “The Usual Suspects” and director of 2000’s sharp but neglected “The Way of the Gun.”) They teamed on 2008’s “Valkyrie,” directed by Bryan Singer, and McQuarrie did uncredited script work on last year’s top holiday hit “Mission: Impossible – Ghost Protocol,” helmed by Brad Bird. I recently spoke with McQuarrie by phone in London, where he was working on the script of Cruise’s science fiction saga “All You Need is Kill,” which is expected to be produced next fall. We discussed making a radical shift in the plot of Child’s bestseller, his unexpected return to directing, and his lack of concern with Reacher fans’ concerns. Q: You have an unusual entry on your resume that I think a lot of directors would benefit from. What did you learn doing security for four years in an inner city movie theater? A: It’s the world’s best focus group and film school. I used to laugh with Bryan Singer that when he was at USC, I was at the Amboy Multiplex. It was a city called Sayreville, N.J. The opening credit to “The Sopranos” was my commute to work. It taught me not to write the movie but to write in anticipation of the audience’s reaction to the movie. Q: It looks like the studio anticipates “Jack Reacher” will be the next big franchise. When you were brought in, were the expectations so high? A: I don’t believe anybody believed the movie was going to get off the ground. When they handed it to me they’d had these books for a while. There had been several attempts to make them into movies. Somebody somewhere said we should probably give this one more try before we call it a day. Q: Was it always conceived as a Tom Cruise vehicle? Q: The film is coming to theaters three months ahead of the original schedule. Did that affect your production? A: No, we were shooting far ahead. The biggest time pressure came when we found out Rosamund Pike was pregnant and we had to rush to shoot all her scenes before she started to show. Q: After 12 years on the sidelines, did you feel limber and prepared as a director or did you feel you had to do some catch-up? A: I probably learned more about directing working on “Valkyrie” and “Ghost Protocol” than I did directing “The Way of the Gun.” On that one so much was happening, I knew so little and was managing so much singlehandedly that I only saw the mistakes I was making when I sat down to cut the movie together. On “Ghost Protocol” I came in on the middle of the shoot to do a rewrite of the screenplay, though they had already started the movie. I had to communicate with the entire staff to determine what I could and couldn’t change, what sets had been built or struck, what scenes I could or couldn’t reshoot. I learned so much about production being right there. When “Reacher” came along it was a walk in the park. Q: What was your brief on the “Mission: Impossible” rewrite? A: The script had these fantastic sequences in it but there was a mystery in it that was very complicated. What I did was about clarity. The mystery had to be made simpler. It’s like reaching into a sock and pulling it inside out. It’s still a sock, still all the same pieces, but all put together in a different order. Q: Is that what you did with “Jack Reacher” as well? A: The only difficult moment in the movie comes when the entire plot of the film is explained. It’s a challenging plot in the book. I had Tom’s character and Rosamund’s character in long, talking scenes with one another. And yet another scene would come where she’d explain what she had discovered about the villains when she uncovered what it was they’re doing. And I stopped when I got to page 90. I said to Don Grainger, “I cannot write one more scene where Reacher and Helen talk to each other.” So I walked away and wrote another screenplay I’d been hired to write. The solution was to have her explain the villains’ plot to someone else in a way that creates tension and suspense. What’s different from the book is that Reacher never really learns what the villains are all about. On the one hand, that’s blasphemous. On the other hand, I don’t think Reacher cares. He knows who the bad guys are. He really is only interested in protecting Helen. That allowed us to define a different sort of hero for Tom. This guy who has no luggage, has no baggage literally and figuratively, who has no phone, no email, no fixed address, no driver’s license. He’s an extraordinarily efficient, pragmatic human being. His only Achilles heel is that when he sees something wrong, he can’t walk away from it. The other dimension of it is quite frankly Tom and the way he eased into this character. He tends to play characters who are under extraordinary pressure and chasing after the key to the plot of the movie. I told him early on, “Reacher is like no one you’ve played before because he does not experience pressure.” When I said that I could see him visibly relax. I think he had a good time playing this role because he got to be more like who he really is.